With the roll-out of ABB’s Azipod “D” series of gearless thruster this past March, I decided to make my way over to Helsinki to see where and how these impressive machines were built, and upon arrival I quickly realized there was a lot more to these thrusters that I had realized. A “V” class of Azipod is built for year-round operation in the worst possible ice conditions, and as such, is made of extraordinarily thick steel and subsequently can weigh hundreds of tons per thruster. The other thrusters in their line up are equally as large from a dimensional standpoint, however greater consideration is given to the hydrodynamic design and functionality for use in far more temperate environments. Kimmo Kokkila, Product Manager, Thruster Products at ABB notes their new “D” series of thruster is targeted for accommodations vessels, windmill installation vessels and the offshore drilling sector and can be configured in a number of different ways including ducted or open-pulling where the propeller is at the leading, vice trailing end of the thruster. In addition, the thruster itself can be powered via a permanent magnet (PM) or induction-type motor. “PM motors have better efficiency as the rotor is naturally magnetized so it doesn’t need to take power from the stator to magnetize itself like an induction motor does. These magnetic materials are so called “rare earth metals” so the price of PM motor is usually higher compared to an induction motor where special materials are not needed. However, PM motor can give higher power density so it’s not always clear which one has better price/power ratio. The physical design of the “D” series Azipod can also be customized as well for the particular application. One feature is the angle at which the thruster is directing its thrust. A zero degree or 8 degree angle can be chosen depending on the application. Wartsila, one of ABB’s competitors within this space, featured their downward angled thruster design during SMM Hamburg in 2013. In addition to the angle of the thruster, the height of the thruster’s strut can be modified to ensure adequate space between the propeller and the vessel’s hull, a very significant hydrodynamic consideration. 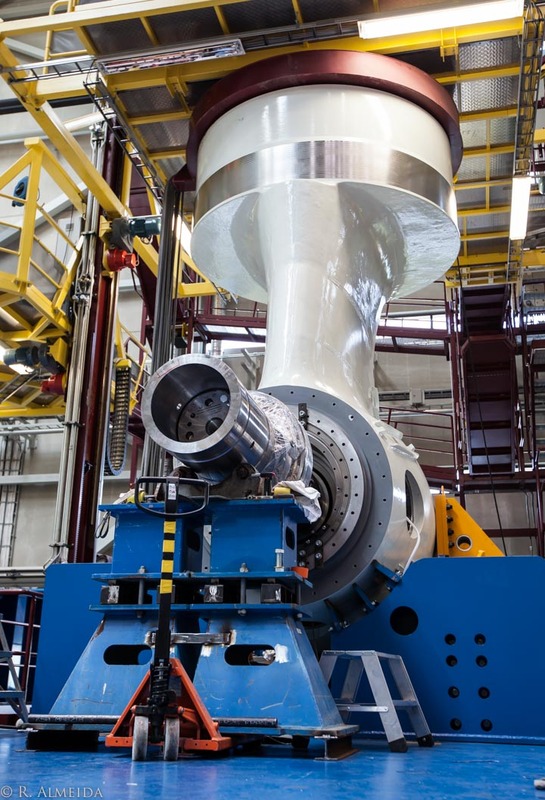 ABB says that because this thruster is both air and seawater cooled, efficiency gains of up to 45 percent have been seen as compared to similar thrusters. And, as a result of this resultant higher power density, the company notes that smaller thrusters could be specified for equivalent ships. About 300 meters down the road is ABB’s neighbor, Aker Arctic, one of the world’s only tow-tank that is specifically designed for testing scale models in ice environments. This third generation tank has been the testing grounds for vessels and propulsion systems destined for the most harsh environment on the planet. As the photo below clearly shows, working in the towing facility at Aker Arctic is exactly like working inside a freezer. Below the 75 meter x 8 meter tank is a walk way that allows engineers to see what is happening below the surface of the ice during a test. The tank’s depth is 2.1 meters. Arto Uuskallio, Sales & Marketing Manager – Aker Arctic (R) describes the capabilities of the test facility. Aker Arctic has developed around 60 percent of the worlds existing icebreakers, a majority of which feature ABB Azipods.